Prayer Beader – Tara L.
“I can’t begin to express how appreciative I am to you for your wonderful book and for the way it has so deeply inspired me. After I listened to the interview, I was so moved by your honesty about your faith and by your warm personality. It wasn’t long before I had your book in my hands, and it literally hasn’t left my immediate grasp ever since. By the second day of owning it, I’d already made my first set of prayer beads (from plastic beads obtained from a local Wal-Mart during my lunch break from work). Today I made my second set with some glass beads from my bead stash, and I’m already making plans for other sets. I love praying with them, and their very presence in my environment makes me feel closer to God while they serve as a reminder that He is always only a whisper away. Well, I couldn’t let that invitation go by, and soon Tara and I were off on an email correspondence, complete with pictures, and I want to share what she said with you. You must read the part about why she brings the prayer beads to her lips when she prays! It sent a shiver down my spine! I have to try this. Wow. Here is some of what Tara wrote to me about her life, her faith background and how and why she prays with beads. 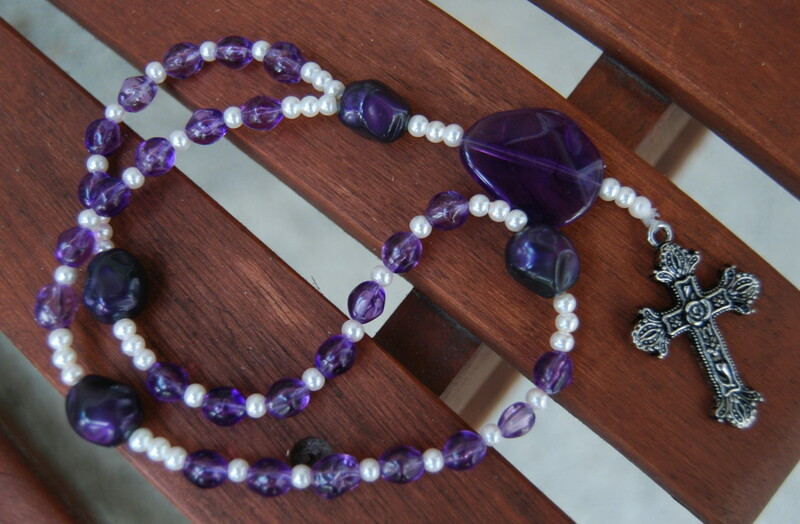 And take a look at her beautiful prayer bead creations! 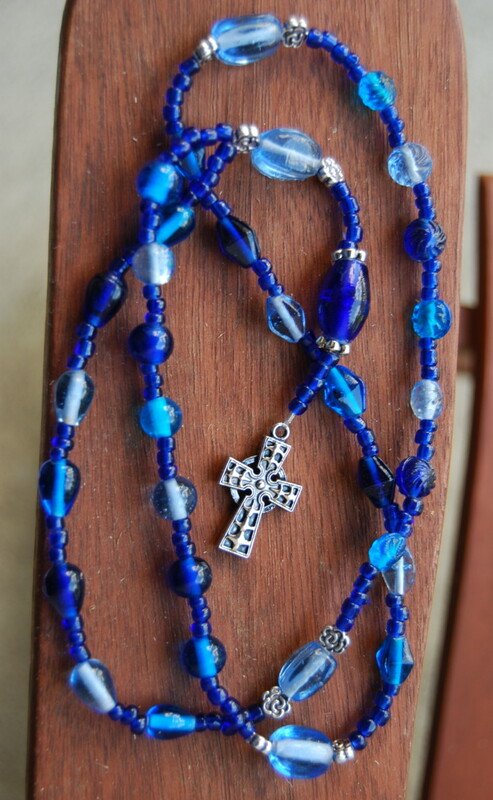 She also wrote to tell me that she just noticed that she was so eager to have a set of prayer beads that she made her first set – this set of purple beads – with only six, not seven, weeks beads in two sections. I told her to leave it be – it would remind her of how hungry she was for prayer every time she uses them. Here’s Tara . . . . .
“I feel a little like I’ve lived one of those lives in which no answer is straightforward. I’m in a rather dark period of my life right now; the kind in which it seems that there is discontent in almost every aspect of my existence. I think this may be a big part of why prayer has become so crucial to me presently. It’s my coping mechanism and my connection to God, who I have hopes will pull me out of this soon. “Right now I’m living just north of Nashville, Tennessee, and I’m working as a Family Nurse Practitioner in a walk-in sort of clinic. My background is in women’s health though. I worked as a labor and delivery nurse for 4 years before I returned to school in 2005 to get my Masters in Nurse-Midwifery. However, I found myself having significant difficulty finding the right midwifery job after graduation, so I took my current job to pay the bills. I’m left feeling very lost and unsatisfied because I so miss my women. In fact, my scope of care in this setting is exclusive of women’s health. I’m not sure what God’s plan is for me right now, but I’m trying very, very hard to hold on to the knowledge that there is something wonderful for me just around the corner. “I’ll be turning 30 at the end of this month, and I’ll admit that I’m having a bit of a personal crisis about it. I remember being a very young adult and saying more than once that I wanted to be done having babies by the time I was 30. Because of life’s unexpected twists and turns, I’ve not yet even started having babies. The one thing I’d give up just about anything for is to be a mother. It is a debilitating hole in my heart, this need I have for my own children. “I was raised in a nondenominational church with my father as the pastor. We worshipped among folks from many different faith backgrounds, so I was very accustomed to things like applause offerings, speaking in tongues, and worship services that could go any direction at any time, depending on how the Spirit moved among the congregation. As a child and young adolescent I had a firm grasp on who I thought God was and what He was about. All of that changed when I was 12 when my father resigned from the church he and my family had built and my parents divorced. My mother and I moved out of state, and we began to attend a very traditional Southern Baptist church. By the time I was in college and too old for the youth group, my interest in attending the church really faded away. “Years later when I was out of school and working, I found a Presbyterian church near my home. It was a very accepting, spiritually-charged evangelical sort of church. It was rare that I didn’t find myself sitting in my seat with tears streaming down my face while in that church. I left it only because I moved away to attend graduate school. School left me without the time to attend church, and unfortunately, I’ve not found myself back yet. I do miss it, and I hope to get back into a church soon. Because of my background, I don’t feel that I need to find a specific denomination to feel at home, so I’ll just have to find the right fit for me. “I’ve never used any form of prayer beads before, but I can’t remember a time when I didn’t wish I could have something to be a daily reminder for me to take some time to talk to my heavenly Father, to spend some quality time with Him. I’ve long admired the Catholic faith for its ritual and its many signs of devotion, and I’ve thought in the past that I might feel at home in an Episcopalian congregation. Prayer beads have been just the answer I was looking for when I wanted something ritualistic and tangible to feel connected to God. Thank you again for introducing me to them! “I’ve only been using my prayer beads for about a week now, and I feel like I’m still exploring how to use them in my personal spiritual journey. I have found that I don’t want to leave them behind when I leave home, so for right now, they go where I go. I’m comforted to know they are within arm’s reach of me at any time. While I knew intellectually before that God was always that close to me, the beads are a physical reminder that He really is only an intention away. I love the chapter in your book about praying with attention and intention. It is absolutely the difference between reciting prayers and actually praying. “I have a little pocket book that I’m finding particularly helpful. It’s called “The Bible Promise Book” and has scriptures (KJV) organized by subjects like courage, prayer, worry, fear, forgiveness, joy, honesty, etc. I also have a teeny Bible given to me by a representative from the Gideons one day when I was walking to class in graduate school that has an index of sorts in the front. The index has “Where to find help when…” at the top of the pages and subjects with scriptures listed beneath (things like “afraid,” “sorrowful,” “tempted,” and “weary.”). 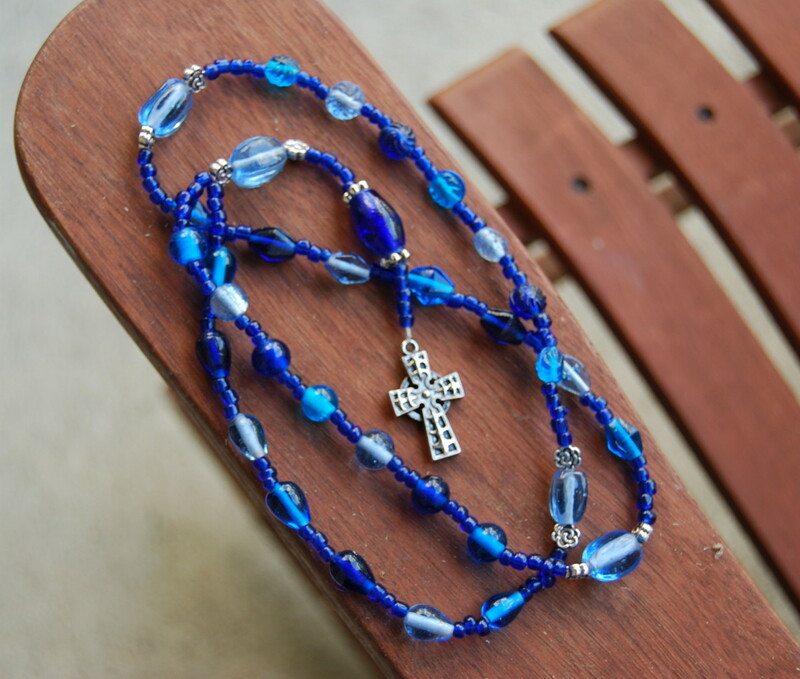 “Last night I was praying with my beads, and I found myself just praying spontaneously. Over the weeks beads, I prayed for 7 different things for each of the 3 members of my family and for myself. It felt good to organize my requests before God and to have time for each of the members of my family so that I could focus on really bringing them before the Lord in prayer. This was an unexpected way for me to use the beads, but it just felt right. Pretty great, huh? What do you all think? I am happy to hear from anyone who would like to share their beads and prayers.